SoftLayer was founded in 2005 and was acquired by IBM in 2013. The company offers enterprise scale cloud hosting. It has data centers in many cities around the world including Washington D.C., Seattle, San Jose, Houston, Dallas, Singapore, and Amsterdam. SoftLayer’s headquarters is in Dallas, Texas. SoftLayer’s solutions are targeted at large businesses and those who run numerous websites. They are not ideal for individuals, bloggers, and those looking for budget plans. SoftLayer is a serious hosting service provider that offers experienced support as well as solid infrastructure in diverse locations around the world. The prices of virtual servers depend on the cores, RAM, and storage you select. You can choose hourly or monthly billing. SoftLayer offers a 100% network uptime guarantee. The company’s global data centers are equipped with state-of-the art infrastructure. Security features include standardized pod design, redundant, best-in-class infrastructure, and high performance rack architecture. The data centers are manned by expert data operations employees. Each data center has 24/7 on-site security and rigorous controls. How Much Does SoftLayer Cost? SoftLayer offers popular control panels like Cpanel, WHM, and Parallels Plesk Panel at an extra cost. Each business is different, and may require a special solution that will be designed for their company size, type of customers and employees and even particular niche they support. We advise you don't count on locating an ideal service that will be suitable for each company regardless of their history is. It may be a good idea to read a few SoftLayer reviews first and even then you should pay attention to what the hosting service is intended to do for your company and your employees. Do you require a simple and intuitive hosting with just essential features? Will you actually make use of the complex functionalities required by experts and large enterprises? Are there any particular features that are especially beneficial for the industry you work in? If you ask yourself these questions it will be much easier to locate a trustworthy service that will fit your budget. We realize that when you make a decision to buy Hosting Services it’s important not only to see how experts evaluate it in their reviews, but also to find out if the real people and companies that buy it are actually satisfied with the product. That’s why we’ve created our behavior-based Customer Satisfaction Algorithm™ that gathers customer reviews, comments and SoftLayer reviews across a wide range of social media sites. The data is then presented in an easy to digest form showing how many people had positive and negative experience with SoftLayer. With that information at hand you should be equipped to make an informed buying decision that you won’t regret. SoftLayer offers 24/7 technical support through phone, live chat, and tickets. Support staff respond to a ticket within 20 minutes and answer phone calls promptly. Customers can also use a knowledgebase named KnowledgeLayer, help forums as well as automated tools on SoftLayer’s website. What are SoftLayer pricing details? Yes, SoftLayer supports WordPress blogs. Yes, SoftLayer offers both Windows and Linux hosting. SoftLayer uses best-in-class infrastructure and rigid security features at its data centers to provide secure hosting services. SoftLayer accepts credit cards and PayPal for payment. SoftLayer offers a 100% network uptime guarantee. Do they enable you to effortlessly set up a website with no HTML or coding knowledge? 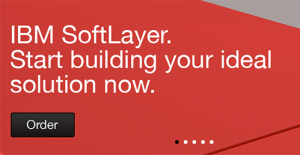 SoftLayer offers a SiteBuilder license to help novices easily create websites without technical knowledge. SoftLayer provides widely used control panels like Cpanel, WHM, and Parallels Plesk Panel at an extra cost. SoftLayer offers a range of solutions for e-commerce businesses. SoftLayer does not offer unlimited bandwidth. There is no information available about unlimited email accounts.